Is WipEout HD Failing An Epilepsy Test? 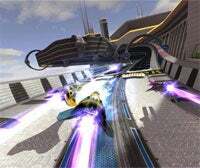 Considering the version we played at TGS last September looked pretty slick, the continued absence of WipEout HD from the PSN is a puzzling one. SCEE's David Reeves said last week the delay is down to a "really, really tricky technical problem", but failed to go into specifics. What kind of problems can cause such a long delay? Here's a possibility: the game's failing important, necessary epilepsy tests. That notion was raised in the comments of our post, and have now been raised by CVG as well, though it's important to note that this is far from confirmed, and Sony have yet to comment on the claims. As far-fetched as they sound (it could just as easily be something like, oh, online MP issues). WipEout HD Has "A Specific Technical Problem"